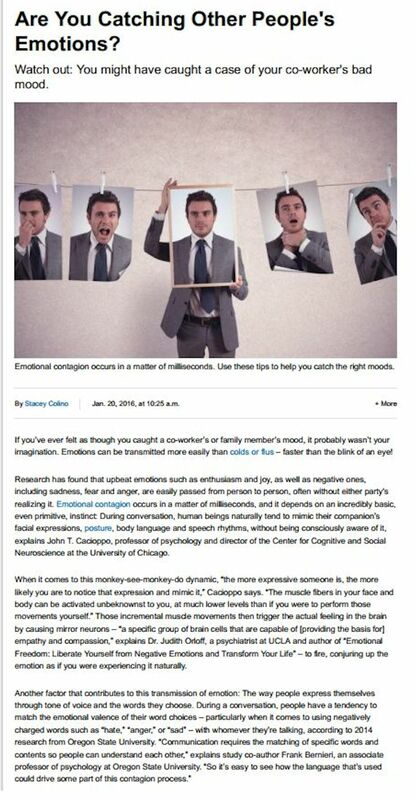 Are you catching other people’s emotions? Have you ever left a conversation with a friend or co-worker only to feel worse than when it started? Emotional contagion is when one person’s emotions and behaviors directly trigger similar emotions and behaviors in another. The emotional transmission can happen in milliseconds without our conscious awareness of it. In comparison, interactions with others who are enthusiastic and happy can leave us feeling renewed and excited. Whereas interactions with someone who is grumpy or angry could leave us feeling depleted and in a bad mood. Our vibrational resonance with another person is important in compatibility, which is why it’s important to choose positive people to be around. In this U.S. News World & Report article, I share how to recognize your limits and protect yourself from absorbing too many negative emotions from others. Read the full article on U.S. News World & Report here.